The Riders first performed on November 11, 1977 at Herr Harry's Franks and Steins in Nashville, TN. For this first performance, the Riders consisted of Deputy Doug (Douglas B. Green), Windy Bill Collins, and Fred LaBour. Happy with the crowds reaction, the Riders performed for the second time at Herr Harry's the next evening. Between the second and third performances, the band still didn't have a name, but that changed in December 1977, when Fred LaBour found a copy of The Sons of The Pioneers album: Riders In The Sky. When LaBour saw the album, he immediately called Green and told him that Riders In The Sky should be the band's name. Green agreed and from their third performance on, they were officially billed as Riders In The Sky. In 1978, Bill Collins left the Riders shortly after "Tumbleweed Tommy" Goldsmith joined. Shortly after Collins left, "Woody Paul" Chrisman also joined the band. In mid-1979, Tommy Goldsmith left the Riders shortly before the recording of their first album, which would become Three on The Trail. The band remained a trio throughout most of the 1980s until Joey Miskulin became an official member in the late 80s. At most performances, the members are introduced as "Too Slim: The Man of Many Hats" (sometimes introduced as "The Man With A Dozen Friends"), "Woody Paul: The King of The Cowboy Fiddlers", "Ranger Doug: The Idol of American Youth" (sometimes introduced as "Governor of The Great State of Rhythm"), and "Joey The Cowpolka King". In their first 35-plus years, Riders in the Sky have performed in over 6200 live performances, almost 300 national television appearances, over 200 public radio shows, 700 Grand Ole Opry appearances, three television series: Tumbleweed Theater(1983-1988), Riders Radio Theater: The TV Series(Occasional specials from the early-to-mid-1990s), and Riders In The Sky(1991). The Riders appeared in animated form on an episode of "Duck Dodgers" on Cartoon Network and have released more than 30 albums. The group also wrote and appeared in numerous Christmas specials on TNN and CMT in the 1990s. They are based in Nashville, Tennessee. Riders Radio Theater was the Riders in the Sky's radio show. It originated in Nashville, with WPLN-FM as the presenting station, but later moved to Cincinnati, Ohio, and can now be heard on WMKV, iTunes, and the official Riders In The Sky SoundCloud page. 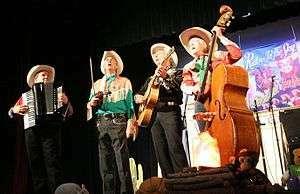 Riders in the Sky perform authentic renditions of old classic cowboy and Western songs, as well as original works and various comedic skits and songs. Their sketches often include allusions to something being done in a dishonest or lazy manner; with Ranger Doug typically responding to this observation by saying "You fellers know that that would be the easy way. But it wouldn't be the cowboy way!" Riders in the Sky performed with America's Got Talent finalist Taylor Ware at the Grand Ole Opry when she was nine years old. They also appeared in an episode of Barney & Friends. The Riders recently appeared as musical spokesmen in a series of Yella Wood commercials. These popular ads spoof the 1930s era Western singing cowboy serials. ↑ show 189 of the WoodSongs Old-Time Radio Hour The answer to when they first began performing is given as November 11, 1977 19 minutes into the video which includes conversation and performance; taped 01-07-2002. Audio can also be had at this archive page Archived March 20, 2008, at the Wayback Machine. ↑ "Riders Radio Theater". SoundCloud. Retrieved 2016-09-28.